North Carolina A&T sackmaster Darryl Johnson is the first Aggie to win the award since 1997. EAST GREENSBORO (December 4, 2018) –North Carolina A&T Darryl Johnson, Jr. did something Tuesday morning that has not been done at N.C. A&T in a long time. 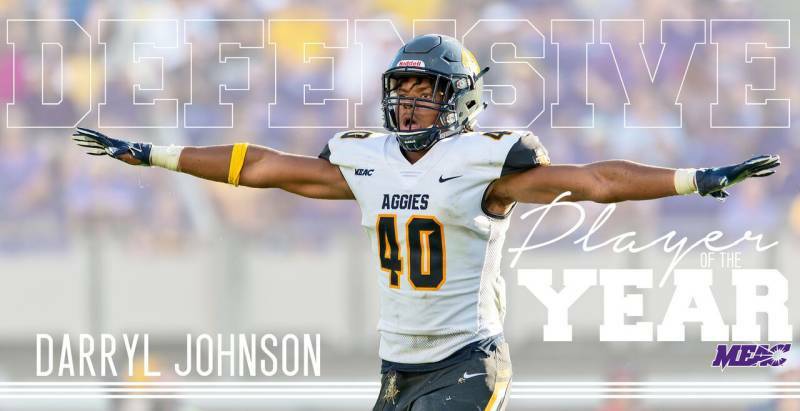 Johnson (6-foot-5, 232, RJR, Kingsland, Ga.) was named the Mid-Eastern Athletic Conference Defensive Player of the Year announced at the National Football Foundation breakfast banquet in New York City. Johnson is the first Aggie to win MEAC defensive player of the year since Chris McNeil won the award in 1997. Johnson joins Ben Blacknall (1971), Dwaine Board (1977), Herbert Harbison (1984 as a punt returner), Akinyele Igunmuyiwa (formerly known as Ernest Riddick, 1984), Demetrius Harrison (1988), Rodney Edwards (1992) and McNeil as A&T players who have won MEAC defensive player of the year. Johnson has been an unbelievable pass rusher for the Aggies in 2018. He leads the MEAC in sacks (10.5) and tackles for loss (18.5) and ranks 10thin the nation in both categories. Johnson made an immediate impact to open the season. It was his strip sack of Jacksonville State quarterback Zach Cangelosi that clinched the Aggies 20-17 win over the Gamecocks who came into the game ranked sixth in the nation. The following week Johnson made seven tackles and had a sack in the Aggies upset win over FBS school East Carolina, 28-23. Perhaps his best game of the season came at Savannah State on Nov. 10 when Johnson recorded eight tackles, had 3 ½ tackles for loss and one sack. Johnson also finished the season with 47 tackles (29 unassisted), seven quarterback hurries, three pass breakups and one fumble recovery. Johnson is also a candidate for Black College Football Player of the Year (Deacon Jones Trophy presented by the Black College Football Hall of Fame) and FCS Defensive Player of the Year (Buck Buchanan Award presented by FCS STATS). NCCU and Bethune split two but Eagles take the season series.